Frequently Asked Questions on the Silver Pulser SOTA Instruments Inc.
What tips will help me get the most benefit from my Silver Pulser? Daily, consistent use is critical to getting the benefits of Micropulsing. To ensure consistent use, integrate Micropulsing into your existing daily routines. A daily walk, a long commute, while working, reading or watching TV in the evening—all are great opportunities to add Micropulsing to your day. Choose a time and place that fits your lifestyle to make it a regular part of your day. Here's how one person maintains consistent use: "I use it in the morning every day. I keep it on my kitchen counter where I can see it. I put it on before I start making breakfast." Even when your routine is interrupted by travel or something unexpected, doing what you can to continue your Micropulsing program will help to ensure you continue to get the most benefit from Micropulsing. The Silver Pulser is completely portable, making it easier to take it with you. Once you've determined when to incorporate the Silver Pulser into your daily routine, keep your unit and accessories in an easily accessible spot–a place where you will see it and be reminded to Micropulse. For example, if you plan to Micropulse in the evening, keep the unit where your evening routine happens–if you read, keep the unit with your book or if you watch TV, keep it where you sit. One frequent user says: "I keep it at my desk at work because that's where I'm seated for a long period of time. I use the Silver Pulser right after lunch." Being prepared means you minimize any disruptions to your Micropulsing routine ... by ensuring you are well–stocked with needed accessories: dropper bottle with water to wet the Cotton Sleeves, extra batteries, extra Cotton Sleeves and extra Rubber Probes. With the necessary accessories conveniently at hand, your Micropulsing routine can continue without interruption. During the early days of use, if you feel you've "overdone" it, simply reduce the amount of time you Micropulse each day. Even if you need to take a couple days off – that is okay. When ready, once again start slowly, building up the time gradually to eventually Micropulse for at least two hours or more daily. Drinking plenty of water–especially both before and after each Micropulsing session is important. Drinking some freshly ozonated water gives added benefit. What can be done to reduce skin irritation on the wrist? When using the Micropulsing electrodes, the skin may become irritated. Over time, the irritation usually decreases. With longer periods of continuous use, skin irritation is more likely. Alternate wrists each day. One day use the right wrist and the next day use the left wrist in order to allow the skin to heal. If the pulse is feeling a bit “prickly”, verify the Rubber Probes are fully conductive. Turn the intensity dial up to full and touch the ends of the Rubber Probes together. Does the Yellow Light flash brightly? If the YELLOW Light comes on brightly, the Rubber Probes are fully conductive. If not, contact Customer Care to order replacements. Rubber Probes that are not fully conductive may deliver a prickly feeling contributing to irritation. Wash wrists before applying the electrodes. Our skin has natural oils that can interact with the electricity which may result in a “stinging” sensation. Wet the sleeves using purified water or with Ionic~Colloidal Silver. Ionic~Colloidal Silver has a healing effect. If unable to feel the current using only water, try a commercial saline solution for the eyes. This will be gentler on the skin than adding salt to the water. A conductive gel can be added to the wet sleeves to reduce irritation. Another option is to wrap a small square of paper towel around the electrodes instead of using the Cotton Sleeves. A customer passed this idea along from her health practitioner. Keep the paper wet. We find it works well and a small square of paper may last for several applications. Wash wrists well after each session and apply a healing gel or lotion such as aloe vera, vitamin E oil or MSM cream. Drink enough water to keep the body well-hydrated. Your degree of hydration may affect your sensitivity. Apply the Micropulsing electrodes for shorter periods of time until the irritation disappears. Why can’t I feel the current on my wrists? Sometimes even experienced Micropulsers have days when they don't feel the current – or it seems weaker than usual. Each individual is unique, and there are a lot of variables in how each of us sets up the Silver Pulser for Micropulsing. There isn't one single reason why the strength of the pulse might feel weak. Make sure you are well–hydrated (this is probably the most common issue). We’ve found that customers who are dehydrated often have trouble feeling or detecting the pulse. Good hydration is essential to good health, influencing the ability to think and concentrate, heart rate, blood pressure, kidney and digestive functions, bone density, even preventing or decreasing wrinkles! If you tend towards low blood pressure, you can try drinking a glass of salt water (¼ – ½ tsp of Celtic salt to water) a few hours before pulsing. Ensure the Cotton Sleeves are over the pulse points and that the Wrist Strap is holding the sleeves firmly against your skin. This will ensure good contact between the Cotton Sleeves and your wrist. Although many people use plain old tap water, you can add several grains of salt to some water and dampen the sleeves with that. This will increase the conductivity. Another alternative is to add Conductive Gel to the wet sleeves. This will also increase the conductivity and can be gentler than salt. How wet are the Cotton Sleeves? If too wet, the moisture can pass between the two Cotton Sleeves diverting the current away from the pulse points, so you won't feel the microcurrents. Your wrist and Wrist Strap should be dry in–between the Cotton Sleeves. On the other hand if the Cotton Sleeves aren't wet enough, that's a problem, too, as you won’t feel the microcurrents. Aim for a "happy medium". Also, remember to periodically clean your Cotton Sleeves with a mild soap solution and rinse well with water. Over time, residue may build up on the cotton which may prevent you from feeling the pulse. Remember to periodically clean your Rubber Probes inside and out, with a mild soap solution, followed by a good rinse of water. Over time, residue may build up on the Rubber Probes preventing you from feeling the pulse. If you've been using the same pair of Rubber Probes for quite a while, it might be time to replace the Rubber Probes. Over time, the Rubber Probes will lose conductivity. You can test them by touching the two Rubber Probe tips together, then turn the unit up full and see if the YELLOW Micropulsing Light flashes brightly. Unbleached Paper Towel: Cut a small square of paper towel large enough to wrap around the Rubber Probe 2 or 3 times. Moisten prior to use. Make your own Cotton Sleeve: Cut a small square of cotton material and wrap around the Rubber Probe with thread. Moisten prior to use. Keep in mind - as long as the YELLOW Micropulsing Light is flashing and you feel the pulsing, everything should be working just fine. How the pulse is felt is unique to each individual. And remember, the intensity dial does not need to be turned up all the way, nor does your hand need to twitch in order for pulsing to be effective. You want to turn the intensity up to a level you can tolerate. Can the Silver Pulser be used for more than 2 hours per day? Yes. While typical use is 2 hours per day for at least 6–8 weeks, many choose to use the unit for longer periods each day. It can be used for more than 2 hours a day and many continue to use the unit for several months and even years. When using the unit, whether for 2 hours or longer, it is important to increase the time gradually. When discontinuing use of the unit, it is also advisable to gradually decrease the time as well. Why were the silver and copper electrodes replaced with conductive rubber? With the rising cost of silver, we knew we needed to find a more affordable solution for our Micropulsing Cords. The successful use of conductive rubber for the Bio Tuner Ear Clips encouraged us to try the same for Micropulsing. We found that conductive rubber works well, even with individuals who have sensitive skin. We are also discontinuing the copper electrodes as they sometimes create irritation. We have previously rejected using both stainless steel and conductive disposable pads, as they caused considerable irritation. When our present stock of silver or copper Micropulsing cords runs out, we will only be offering conductive rubber electrodes. Are there any prescription drug restrictions while Micropulsing? While no interactions have been reported to date, caution is advised if using prescription drugs, as it is not known if they will interact or if individual reactions may occur. If you choose to try Micropulsing while using a prescription, consider pulsing prior to taking any prescriptions for the day. Start very slowly — 10 minutes per day — to see if you have a reaction. From there, slowly work your way up. Please use common sense and if you are feeling hesitant at all, do not use the Micropulsing feature of the Silver Pulser. What is the best way to use the Silver Pulser with the other SOTA units? If looking to use the SOTA units together, begin with a single unit, gradually increasing the amount of time you use the unit day by day. All the while, you’re listening to your body, paying attention to how you’re feeling. If you are experiencing sluggishness, flu-like symptoms or other minor symptoms showing the body is moving itself towards wellness, reduce the time you are using the unit or depending on the experience, take a break for a few days before resuming. The keys are tuning in to your body and consistency of effort. Listen to your body, respect what it’s telling you, and use the feedback. Make adjustments if you need to. The point is not to rush. Each individual is unique. Some may be able to start them all immediately – and others may need to take a more gentle approach. Either way, it’s okay. This isn’t a "one-size fits all" situation. A Wellness Lifestyle is not a race – it’s a journey we choose for ourselves each day. Is it okay to apply Micropulsing to animals? Yes. While Micropulsing was designed for humans, it has been used with pets. The owners of SOTA, for example, have used Micropulsing on their dogs. The Microcurrents were applied for up to 30 minutes, and at a low setting. The electrodes were placed on the inside of each leg, where it was easiest to feel the pulse. If you want to use the Micropulsing feature with your pet, we suggest doing a web search to find the pulse points for your furry friend. Please keep in mind, pets are much smaller than humans. They are known to respond more quickly and may be quite sensitive to the feeling of even gentle microcurrents, so best to proceed carefully. Do not use if it is obvious your pet is uncomfortable or distressed. I’ve heard electricity can be harmful. Why is the Silver Pulser beneficial? The SOTA Silver Pulser has been designed to ensure the maximum life of a battery. Battery life depends on how high you need the output and the type of battery used. We recommend a 9–Volt Alkaline battery as they usually last between 10–15 hours. Due to the advanced circuitry of the model SP7, battery life for this model is typically between 12–18 hours. It is important to use 9–Volt Alkaline batteries. Batteries that are marked “Heavy Duty” or “Extra Duty” are designed for slow drain items and will not work as efficiently with the Silver Pulser. Rechargeable 9–Volt batteries are also an option for powering both features of the Silver Pulser. Be careful though, not all rechargeable batteries are the same size. The only way to be certain the battery will fit in the enclosure properly is to try it with your Silver Pulser. When making Ionic~Colloidal Silver it is not necessary to use a battery. Instead, the Wall Adaptor that comes with other SOTA units, or a purchased wall adaptor, can be used to make Ionic~Colloidal Silver. The wall adaptor should have the following specifications: an output from 6 to 12 Volts DC with a tip or center positive pin that supplies at least 500 mA (milliamperes) of current. Where is the Silver Pulser manufactured? The manufacturing of the SOTA Products is a global collaboration. The following countries participate in the making of the Silver Pulser (listed in alphabetical order): Canada, China, Hong Kong, Malaysia, Mexico, South Korea, Taiwan and the USA. Our units say Made in China because China is the last step in the assembly of the units. To ensure consistent use, integrate when to drink Ionic~Colloidal Silver into your existing daily routines. What is the best time for you? After brushing your teeth? In the kitchen? At work? And there are a wide variety of ways to use it, so there are several opportunities to incorporate Ionic~Colloidal Silver into your daily routines. Choose a method, time and place that works for you. Since it is wise to take breaks after drinking Ionic~Colloidal Silver consistently for a few months, develop a system to remind yourself when to take a break and when to resume drinking it. Setting dates on your cell phone, email calendar, or on a printed calendar. To benefit from Ionic~Colloidal Silver we have to use it! It's easy to make it, store it and then forget about it. That is the biggest stumbling block for most people–the solution gets made and then set in a cupboard where it sits. Out–of–sight often means out–of–mind. The solution does need to be stored in the cupboard, so use something that will remind you to take the Ionic~Colloidal Silver–a Post–it note, cell phone reminder or a shooter glass. If the kitchen is a convenient spot for you, set your "reminder" by your blender or juicer so you can have some in the morning before you get on with your day. If cleaning your teeth is a better time for you, keep your silver solution in the bathroom cupboard and your "reminder" by the toothbrush. "I keep a Post–it note on my counter, so that I can walk by it in my kitchen and be reminded to take a swig." "I keep a shot glass on the bathroom counter so I remember to take the Ionic~Colloidal Silver after brushing my teeth in the morning and again at night." In addition to having Ionic~Colloidal Silver made and ready to use, make sure you have distilled water on hand so you can make more right away. If you use a Wall Adaptor for power, mark it "SOTA" so you won't have to search for it each time you use your SOTA Silver Pulser (as a reminder all SOTA Wall Adaptors meet the same specifications, so they are interchangeable). If you use a battery to make your Ionic~Colloidal Silver, be sure to have extra batteries on hand so you can replace a drained battery right away, or have a rechargeable battery ready to go. And don't forget to keep an eye on your Silver Wires–they last a very long time, yet they will need to be replaced when both wires get very thin. Always make sure when you run low on any supplies, that you replenish them right away. Making a larger batch is also an option. In this case, you would need to have a large glass container–one liter (pint) or four liters (one gallon)–as well as more dark glass bottles for storage. Really, the idea is to eliminate or at the very least, minimize any disruptions to your Ionic~Colloidal Silver routine. By having the necessary supplies on hand, you are helping to ensure you can stay with your routine to drink Ionic~Colloidal Silver. For additional tips, please refer to Ways to Use Ionic~Colloidal Silver and the SOTA Products User Guide. How much Ionic~Colloidal Silver should or can be taken daily? Ionic~Colloidal Silver is meant to be used when needed rather than consuming continuously. If taking Ionic~Colloidal Silver on a regular basis, up to 1 ounce (30 ml) per day is sufficient. Some choose to take several ounces, several times per day for several weeks. When drinking a larger quantity of Ionic~Colloidal Silver, it is best to sip in smaller amounts throughout the day, rather than one large dose. This will aid the body to more efficiently use the Ionic~Colloidal Silver. One teaspoon (5 ml) of 5 ppm contains about 25 mcg of silver. That means about 1 ounce or 30 ml (6 teaspoons) contains about 150 mcg of silver. This is ample considering the amounts suggested by Kehoe and Tipton. Does Ionic~Colloidal Silver affect the friendly bacteria in the gut? Many years ago, a biochemist let us know that he had conducted an informal experiment in his lab. After making Ionic~Colloidal Silver in the 3–5 ppm strength, he added it to gut bacteria. He observed the growth of the bacteria was slowed when combined with Ionic~Colloidal Silver. When he stopped adding the Ionic~Colloidal Silver, the bacteria were alive and well. This indicated that the Ionic~Colloidal Silver temporarily halted the growth but ultimately did not harm the gut bacteria. To date, we are not aware of any evidence that Ionic~Colloidal Silver harms the friendly bacteria in the gut. However, having our microbiome–the bacteria in our intestinal tract–teaming with friendly bacteria is critical to our health. For this reason, many people choose to take a probiotic (friendly bacteria supplement) as part of a Wellness Lifestyle. Remember, it is important to take occasional breaks from drinking Ionic~Colloidal Silver. When taking a break, it may be wise to take a probiotic supplement. Will Ionic~Colloidal Silver purify water? Ionic~Colloidal Silver can be used to sterilize water but not purify it. To purify water, a filtration system is required in order to remove dissolved solids, heavy metals and particulate matter. Ionic~Colloidal Silver can sterilize water as it kills bacteria and other pathogens. As a guide, it is suggested to add 3 tablespoons (45 ml) of Ionic~Colloidal Silver to one gallon (4 liters) of water for at least 6 minutes to cleanse mildly contaminated water. This is a highly subjective ratio, however, as the ratio of Ionic~Colloidal Silver and how long it needs to cleanse the water will depend on the degree of contamination. More virulent pathogens would take a stronger ratio for a longer time. Laboratory tests show Ionic~Colloidal Silver made with the Silver Pulser effectively kills pathogens. Argyria is a darkening of the skin, a bluish tinge, which occurs when silver molecules are pushed out to the skin and exposed to light. Darkening of the moons of the fingernails is often an early sign of argyria. The bluish tinge becomes especially noticeable around the eyes and nose. Ingesting very large quantities of Ionic~Colloidal Silver over a longer period of time could possibly result in argyria. It is important when making your own Ionic~Colloidal Silver to use distilled water rather than water with added salt or water that is rich in minerals. The silver will react with the chloride in salt or with the minerals to form compounds. Over time, argyria is more likely to occur, as these larger molecules are not as readily used by the body and are more likely to be pushed out through the skin. Such compounds could also form using silver that is less than 99.9% pure. The risk of argyria is considered greater with larger particle sizes. When made with a constant current unit using distilled water, the particle size remains small so the risk of argyria is considered less. In one case, a large quantity made with tap water was being consumed on a daily basis over several years. The tap water was high in minerals producing silver compounds with larger particles. In another case, a large quantity was consumed over several years that was made by adding salt to the water and later by adding baking soda. The result is larger particles than Ionic~Colloidal Silver that is made using distilled water. In addition, the silver was applied topically to the face for a period of time. In the third case, the Ionic~Colloidal Silver was properly made. The individual had been consuming 8 ounces (250 ml) a day for 4 years. Darkening of the moons of the fingernails had started. The risk of argyria is greater for those who are deficient in selenium or vitamin E and who also regularly consume large amounts of Ionic~Colloidal Silver. In addition to taking breaks from ingesting Ionic~Colloidal Silver, it may be wise to supplement with vitamin E and selenium. 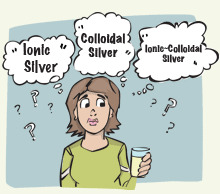 What is the difference between Ionic~Colloidal Silver, Ionic Silver, Colloidal Silver and Nano Silver? The terms Ionic~Colloidal Silver, Ionic Silver, Colloidal Silver and Nano Silver are often used interchangeably, but they are not the same. Ionic Silver is charged atoms (ions) of silver, which are created using a low level of electricity to move atoms of silver from silver wires into water, making what is known as a silver electrolyte. This is a simple electrolysis process. This method of making a silver electrolyte was pioneered by a physicist. The SOTA Silver Pulser produces a silver electrolyte using this method. Colloidal Silver is a grouping of elemental metallic silver atoms, which can vary in size from 1 to 1000 nanometers, depending on how it is made. Imagine taking silver and using very high voltage electricity– blowing the silver up into extremely tiny pieces. As a result, you end up with atoms of silver grouped together into particles of varying sizes. These elemental silver particles are held in suspension in water. The process to make Colloidal Silver is often expensive and complex. Ionic Silver (ions of silver) can also cluster together to form colloids. We estimate the silver electrolyte produced by the SOTA Silver Pulser has 5–10% colloidal properties. Ionic~Colloidal Silver means some of the ions form micro-clusters of silver which are more colloidal in nature. With the SOTA Ionic~Colloidal Silver electrolyte, you have largely Ionic Silver (90–95%) with some of the silver displaying colloidal properties (5–10%). The SOTA Silver Pulser actually makes Ionic~Colloidal Silver because the ions in Ionic Silver have a tendency to group together forming some colloids. Although the properties of Colloidal Silver and Ionic Silver are different, given the nature of silver, both are beneficial. The SOTA Silver Pulser is designed to be an easy and inexpensive way to make your own Ionic~Colloidal Silver electrolyte. Technically, this is not a form of silver. Nano is a unit of measurement, like milli, kilo, inch or mile. The prefix nano means one-billionth, so a nanometer is one billionth of a meter. As a frame of reference, a single sheet of paper is about 100,000 nanometers thick. The size of a silver atom (ion) is about 0.25 nanometers (nm) in diameter. The size of a colloid is 1–1000 nanometers. Does the SOTA Silver Pulser produce nano silver? Although we don’t label the Ionic~Colloidal Silver electrolyte produced by our SOTA Silver Pulser as ‘nano silver’, the particles by definition of size do qualify as nano-particles. What makes this even more confusing are manufacturers who are trying to market their products by interchanging and/or using these words with their own definitions. For example, there is a company calling their silver Nano Silver but by definition it is not. They are producing a Colloidal Silver and have ensured through their manufacturing process that the size of the particles is at the lower end of the colloid definition of 1–1000 nanometers. Other examples are companies that produce a silver electrolyte using electrolysis and name it Colloidal Silver – when in fact it is a mix of Ionic and Colloidal Silver. What are the Different Methods for Making Ionic~Colloidal Silver? When making your own Ionic~Colloidal Silver, the present method using Constant Current produces the best electrolyte. With Constant Current room temperature water is used. The method for making your own Colloidal Silver, first introduced by a physicist, evolved quickly. At first, the physicist demonstrated with tap water. The chlorine in the tap water increased the conductivity. With the application of the electric current, the silver reacted with the chlorine to quickly make a silver electrolyte for demonstration purposes. It is best to avoid chlorinated water, as the particle size is larger as a result of the formation of silver chloride. Constant Current Method: With constant current, room temperature distilled water can be used. The process is not accelerated by heating the water or adding salt as described in the other two methods. Constant current produces a high-quality silver electrolyte that is largely Ionic Silver. The ionic form ensures a very tiny particle size–a form the body seems to readily absorb. Heating Water Method: To increase the conductivity of distilled water, it is heated. This produces an Ionic~Colloidal Silver with a small particle size. Using hot water will not speed the process with a Constant Current unit as it works independently from the temperature of the water. Salt Method: Adding a pinch of salt was originally recommended to increase the conductivity and speed the making of Colloidal Silver. This method has been effective for many people but the particle sizes are larger as the silver reacts with the salt to form silver chloride. This solution may not be as effective and with long-term use the risk of argyria, a darkening of the skin, is higher. Using salt will not speed the process with a Constant Current unit as constant current takes the same amount of time regardless of the water. There are several makes and models available online. These systems are generally installed right to your home water supply. The filtration process will remove much of the minerals and chemicals. If you only have access to bottled drinking water - then look for one with a low to no sodium content. Hopefully, one of the above alternatives will work for you or you will be able to locate a reliable source of distilled water. How do I know I have made the Ionic~Colloidal Silver correctly? When it comes to making Ionic~Colloidal Silver, you need to be aware of the color, clarity and taste. The color of properly made Ionic~Colloidal Silver is colorless to a pale golden yellow. The clarity of the electrolyte is clear – you should be able to see through it. The taste is slightly metallic. Ionic~Colloidal Silver that is dark gold/yellow, white, gray and/or cloudy is not recommended for drinking for extended periods of time and should only be taken in emergency situations, on a short term basis. The best choice for drinking is a clear, colorless to pale gold electrolyte that has a slight metallic taste. If your Ionic~Colloidal Silver is dark gold/yellow, white, gray and/or cloudy, it’s typically due to the water you’re using. Try a different bottle of your regular brand, as it could be that one batch is affecting the solution, or if that doesn’t help, a different brand of distilled water. When do I need to replace the Silver Wires? The Silver Wires last a long time. When both wires have become thin enough to break easily, it is time to replace them. Silver comes off only one wire when making Ionic~Colloidal Silver so rotating the Silver Wires will even the wear between the wires. By interchanging the position of the wires in the Silver Wire Holder with each use, the wires will wear evenly. Can I make colloidal gold or copper, with the Silver Pulser? While we have never tried to make anything other than Ionic~Colloidal Silver with the Silver Pulser, technically it should be possible, however we do not recommend it. We are not aware of the parameters involved in making, nor the safety of ingesting, other colloidal solutions made using the Silver Pulser. Is it okay to give Ionic~Colloidal Silver to animals? Yes. Many people report giving pets Ionic~Colloidal Silver. Some add it to their pet’s drinking water, others place a small amount in a separate bowl entirely, and others use a dropper or oral syringe to place it directly into the mouth of a pet. Ionic~Colloidal Silver is frequently used topically on animals as needed.